A bus driver was shocked to discover the baby girl left on his bus, while police warn against an uptick in parental negligence. Israel's emergency police hotline 100 received an unusual call Tuesday night: A bus driver reported finding a baby girl while he was searching his bus, after he finished his route in the city of Modiin Illit. Patrol officers arrived at the bus terminal, and were shocked to find an infant girl, under a year old, had been forgotten on the bus. 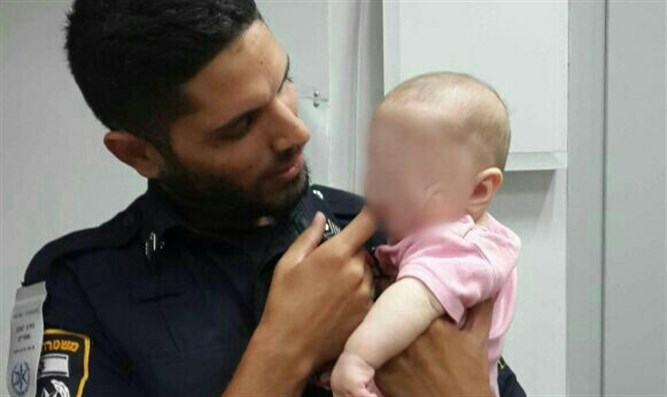 The father of the infant, a resident of Modiin Illit, has been detained by the police and taken in for questioning at the police station. Police remind the public that this is the second forgotten-child incident in the city in one day. Earlier, a two year-old toddler was found wandering the streets of Modiin Illit alone. After several hours, the toddler's father, was supposed to be looking after him, was found and taken in for questioning. Israel Police: "This is the second incident within several hours in which parents, out of negligence and lack of responsibility, forgot/left their small children unattended. Criminal proceedings will be taken against the parents. We take the recent incidents very seriously. Through tremendous luck, the incidents ended without any casualties."